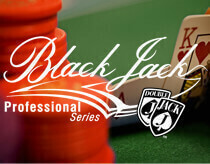 It’s Sin City’s favourite card game classic, Blackjack Professional Series – bought to you by top gaming development house Net Entertainment. 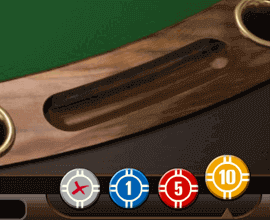 Place your chosen chips on the betting square on the table. Bet limits depend on which level of play you’ve chosen. 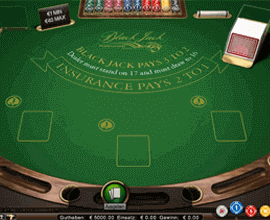 Play between one and three hands every round of betting. Watch as the dealer deals your hands into the card boxes on the table. 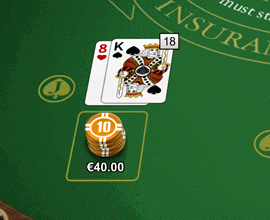 You will then be prompted to make decisions regarding each hand in turn. These are made using the coloured buttons that appear in front of each of the hands. When you have either decided to hold on a hand or bust by going over 21 for all your hands in play, the dealer will play out their hand. 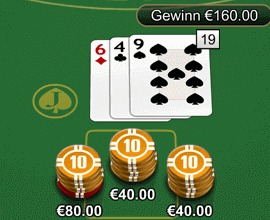 Winning hands that beat the dealer are paid.